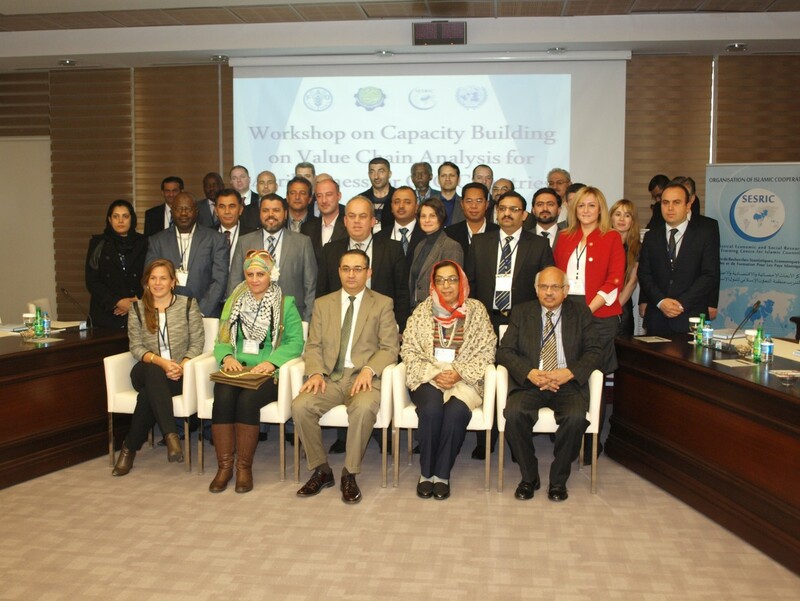 The Workshop on Capacity Building on Value Chain Analysis for Agri-Business for OIC Countries brought together heads of Agricultural Authorities of the OIC Member Countries, as well as directors, businessmen and senior experts from different ministries of 15 OIC Member Countries, namely, Bangladesh, Indonesia, Iran, Jordan, Kazakhstan, Lebanon, Libya, Nigeria, Pakistan, Palestine, Saudi Arabia, Sudan, Tajikistan, Turkey and Uganda in order to provide an opportunity for the relevant institutions and administrations to introduce current state, challenges and improvements of Agricultural Sectors in their respective countries. The Workshop commenced with the welcome addresses by the representatives of ICCIA, SESRIC and FAO. Mrs. Attiya Nawazish Ali, Assistant Secretary General Islamic Chamber of Commerce, Industry & Agriculture (ICCIA), expressed her thanks and appreciation to SESRIC, FAO and Perez-Guerrero Trust Fund (PGTF) of UNDP for their support and contributions and emphasised the importance of the workshop to address the critical agri-business situation in OIC Member Countries, particularly in the least-developed countries. Prof. Savaş Alpay, Director General of SESRIC, indicated that even though the sector represents 34.7% of the total population of the OIC countries in 2011, agriculture is still considered as an important economic activity with high potential to play a significant role in the economic development of many OIC countries. This is particularly true for the 37 agricultural-based OIC member countries, 19 of which are least-developed countries. These countries enjoy high potential in terms of at least one of the main three ingredients of the agriculture sector (i.e., arable land, agricultural labour force and water resources). Prof. Alpay stressed that, there are 31 OIC member countries from different climatic regions ranking among the top 20 producers of major agricultural commodities worldwide. These commodities vary from cereals such as wheat, rice and maize to tropical/temperate zone commodities such as cocoa, coffee, rubber and sugar. Prof. Alpay also stated that, the development of a modern agriculture sector in these countries would, therefore, help reduce poverty, secure food sufficiency, provide additional job opportunities for millions, and promote other sectors in the economy that are related to agricultural production. Moreover, the development of a competitive agribusiness in OIC Member Countries is crucial for promoting productivity of natural resources, as well as enhancing intra-OIC agriculture trade through standardization and generating credit, technology and market access for OIC products. During the workshop, the representatives of the OIC Member Countries shared their information and experiences about the value chain analysis for agribusiness in addressing one or more of the challenges of the Agricultural Value Chain, Food Value Chain and Dairy Value Chain in their respective countries. Finally, the workshop was completed with a field visit to the Ankara Union Milk Factory.